Upon its arrival, the Crunchyroll Wii U application was a welcome addition to Nintendo’s digital library of offerings. The one setback was the fact users had to sign up to Crunchyroll’s premium service or use the trial period to watch their favourite anime on demand. As of today, a significant change has been made. The latest update to the Crunchyroll app for Wii U means free users worldwide can now enjoy the same freemium experience offered on other Crunchyroll apps and the Crunchyroll website. 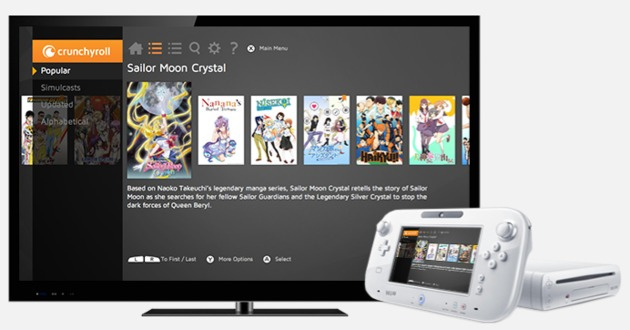 No longer must you lock into the premium Crunchyroll service to watch popular anime shows on the Wii U. Provided you’re cool with standard-definition and a few ads along the way, the free model will let users watch entire seasons of their favourite anime. Of course, if you would prefer high-definition viewing and no ads, the premium experience is still the way to go. This package also includes simulcasts as soon as they are live. A free trial for the premium service is available via the Wii U application. Let us know us know in the comments if you plan to use the Crunchyroll Wii U app now that it includes the free experience offered on other Crunchyroll services, and also what anime you’ll be watching. That's a relief. The subscription fees are relatively cheaper than before, but the ads aren't all that bad. The real premium stuff now is on mobile with the manga on-demand stuff. Xbox why aren't you doing this?? That's good news. Might download it soon. I'll be continuing my One Piece marathon on Wii U! Kereke how is that pertinent, Nintendo doing right by their customers doesn't have to be a black eye for Microsoft or anyone else. Thanks to Crunchyroll, I've been watching No Game, No Life. I usually just watch Crunchyroll on my Roku, but this is great news for Wii U owners. Well, im already a Premium Member but im glad to hear its not forced for this App anymore. Also, since our european offerings are...pitiful, i mainly use it on the browser anyways, since you can simpyl switch your region and have full acess to the other regions anime lineup. Something not possible with the WiiU App, as far as im aware. @kereke12 because its M$. Tru fax sadly. Ya! Now I can finally get started on One Piece! Neat. Guess I'll be downloading that, then. @luke88 Yes, the free service is available worldwide. Can I watch Fullmetal Alchemist Brotherhood on it? I have been wanting to re-watch that show, but I sold my dvd set a couple of years ago. Cool news. I'm a Premium subscriber and switch my region to watch the US selection through my Wii U. I've always found the service to be reasonably priced, but at least you can dip your toes in the water more easily if you've never tried it before. Good, it should have been this way from the beginning. Good, now come to Europe! Um...yay I'm so happy to hear this cuz I love anime. I'm all for the freemium model, I can deal with 3 30second ads 3 times in a 25 minute window. But, the only complaint I have is the same d&#m ad (sometimes all 3 ads in one commercial break). that being said, when winter rolls around, I'm probably doing premium. $60 for a year of HD, Ad free anime is an insane deal! That could have been very useful a lot early since I just ended Gurren Lagann literally a day ago. Brilliant, I think I'll give it a try and if I like it will sign up for the premium version, great decision. Wow! Might need to check this out now! What, Crunchyroll? It's been out in Europe for almost 6 months. No Game, No Life is on Crunchyroll? So now instead of game, no life, I can play no game and have no life. Yeah I've been using Crunchyroll fine without a premium account in Europe. Been watching Food Wars since the start but like the iOS version I'm a week behind cause im not premium. It's been out in Europe for roughly two months. It has been longer in Europe than 2 months. Probably that 6 moths. I signed up to premium eventually, not bad price monthly and it seems somehow I logged on hubby's tablet and he is very excited about it! Been watching classic Yu-Gi-Oh! in Japanese on it. @Einherjar, you just need to go in settings and change the language. Since there are EU options like UK here, I imagine the app doesn't have region lock. Is it really SD? I've been watching Hunter x Huenter and it seems pretty HD to me. Edit: SD confirmed. Wish I hadn't read this haha, I couldn't tell. @Liam_Doolan ah great, thanks for getting back to me! It was actually your one piece comment that piqued my interest. I'm running that marathon myself, just recently passed ep. 300. So, so good. Free tv with ads is ok by me, it's having to pay the cable company and still having to watch commercial that sent me away from them. Time for a Hunter X Hunter marathon! This is good news, now I don't have to use my PS3 to watch for free. I'm still hoping for an update that adds touch control for the Gamepad. It's so weird going to tap on a show, remembering that doesn't work, then using the D-pad and buttons to do it instead. Does Crunchyroll have options for language? I prefer my anime in Japanese audio and these news made me want to give CR a try, so I'd like to know a bit about that. I watched the whole Persona 4 The Golden Animation the other day thanks to this. @PBG72 Yeah I found out. I started watching JoJo's and it's in Japanese audio with subs. Pretty cool, I'm surprised at how fast it plays and how good the quality on the Gamepad looks. The ads get annoying though but still kinda manageable. It's been available in Europe since January... Plus you have the anime Channel. No way! Seriously? Awesome! I'll definitely check this out sometime soon! @IAmDeclanJay Yeah. I usually prefer dubs over subtitles for a similar reason. @whodatninja haven't you check on wii u application on EU eshop? It's like I'm really watching TV on the internet! About time....I just started streaming it from my Laptop. Does it have Pokemon? I've always liked the art style of anime but like, it's hard to find ones I'll enjoy. @MasterWario no pokemon, but there is digimon. I'd also recommend to you RurounI Kenshin as it's on Crunchyroll and also in english. But if you're looking for a show similar to pokemon I'd recommend The Slayers, the only difference is that they have magic instead of pokemon. It also has most of the English voice cast as well. I watched the first two episodes of Himouto! Umaru-chan using the free version today, and the app worked great. The quality was pretty darn good on the GamePad despite being free, though the ads are still placed in stupid places where it makes no sense. These aren't in any particular order. I like them all, but I definitely like some more than others. @kereke12 it was already like that on Xbox One. Now i can finally watch those free episodes also in my bedroom with WiiU's gamepad. @mudmask agreed for me it depends on the anime, if its all mediaeval samurai the subs it is. But if where its set isnt relevant and the dub isnt terrible then thats my default. I'll check it out. Now if we could only get an update to the Netflix app to allow for different users on the same account, like what's available on other systems. I will probably use this. My android tablet is slowly dying and this will serve as a replacement. Can someone tell me what the differences in the Premium and Free packages?......besides the price! @ccanfield1 Plus, I wish Netflix would do continuous viewing (similar to Hulu) where you have the option to pretty much plow through episodes without your input. Sugoi! Oh sorry there, inner otaku just came out for a second, I've been having a serious jonesing for trying out more anime, any recommendations (aside from the usual; naruto, pokemon, sailor moon and etc). I've heard good stuff about Samurai Champloo.